This is another of D.W. Griffith’s progressivist message pictures, made well into his career at Biograph studios, at a time when he was itching to use longer formats and express film as an artistic medium, but was constrained by his budgets and production schedule. The specifics of the story may appear a bit silly to modern audiences, but to best understand it we should keep our attention focused on the broader moral message of the piece, which is a critique of both over-indulgence of children by parents and of greed for profits that causes blindness to the harm that is caused in money-making. A middle-aged doctor (Charles Hill Mailes) has a wastrel son (Charles West) who keeps spending his allowance faster than the old doc can earn it. The doctor comes up with a get-rich-quick scheme: he’ll just mix in some of his therapeutic cocaine with a soda pop and make a mint! 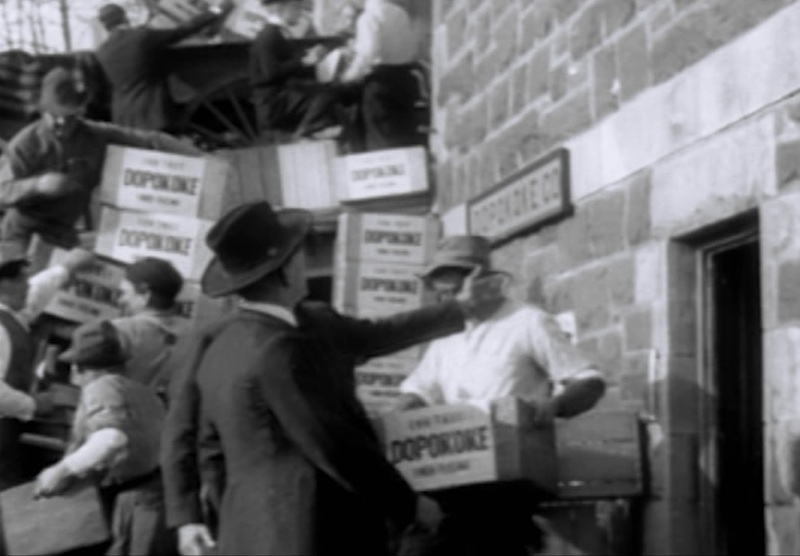 It works like a charm, and pretty soon drugstores all over town are carrying “Dopakoke,” the new soft drink sensation. The doctor has plenty of money to give his son now, and also to expand operations, hiring a PR man and a secretary (Dorothy Bernard), as well as quite a number of Dopakoke-loaders for all the trucks. The secretary tries Dopakoke, and decides it’s all right, even after she learns the secret ingredient. West and his cronies go out to a drugstore and decide to try it too; soon he is stealing from dad’s cocaine stash to spice up his sodas. West pays a call on his fiancée (Blanche Sweet), who detects that something is wrong when he starts showing off his track marks (apparently he has upgraded to injection now). When Blanche throws him out, he elopes with secretary so that they can shack up in a seedy room and indulge their true passion. Before long, they’re fighting over the needle until West makes like Sid Vicious and only now does his father learn his mistake. As goofy as the story may appear to us today, it is true that for some time (while it was still legal to do so), the Coca-Cola recipe did have some quantity of cocaine in it, and there was concern that its addictive properties might be transferred to the soda. Evidence suggests that by 1912, so little of the drug was present that it was probably negligible (and not as bad for you as all that sugar), but Griffith can’t fairly be faulted for not knowing that. What he attempted to do was to show the horrors of drug addiction in a movie long before this became an accepted genre of film, and, as I’ve suggested above, to speak to more universal moral concerns. As with his other shorts, the movie is an effectively intimate look at human beings affected by a broader social problem. The photography is fairly standard, once again being limited to small studio spaces and an occasional exterior of a doorway, and the large cast is at times cramped into small areas, but the editing is lively enough to keep the story moving forward. There may be a few unintended laughs in this one, but it’s still worth a look.